There was improvement in cognitive performance and brain function in those who took the blueberry powder. Blueberries, already deemed a“superfruit” for their power to potentially lower the risk of cancer and heart disease, may also help prevent the effects of Alzheimer’s disease, according to research presented at the 251st National Meeting & Exposition of the American Chemical Society (ACS) in San Diego. “Our new findings corroborate those of previous animal studies and preliminary human studies, adding further support to the notion that blueberries can have a real benefit in improving memory and cognitive function in some older adults,” Robert Krikorian, PhD, of the University of Cincinnati Academic Health Center said in a statement. He added that the beneficial effects of blueberries could be due to flavonoids called anthocyanins, which have been shown to improve cognition in animals. Currently 5.3 million people in the United States suffer from Alzheimer’s disease, a number that is expected to increase as the US population ages; according to the Alzheimer’s Association, the number could rise 40% to more than 7 million people by 2025, and could nearly triple by 2050. To explore ways to slow these rising numbers, Dr Krikorian and colleagues conducted two human studies that follow earlier clinical trials. In one study, the researchers recruited 47 adults (ages 68 and older) who had mild cognitive impairment, and either gave them freeze-dried blueberry powder equivalent to a cup of berries or a placebo powder once a day for 16 weeks. Functional magnetic resonance imaging (fMRI) showed increased brain activity in those who took the blueberry powder. In the second study, the researchers recruited 94 participants (ages 62 to 80) who did not have objectively measured cognitive issues, but who subjectively felt that their memories were declining. They were divided into 4 groups that received either blueberry powder, fish oil, blueberry powder and fish oil, or placebo powder. “The results were not as robust as with the first study,” Dr Krikorian said. “Cognition was somewhat better for those with powder or fish oil separately, but there was little improvement with memory.” The fMRI results were also not as striking for those receiving blueberry powder compared with the participants in the first study. According to Dr Krikorian, the effects of the second study may be smaller because the participants had less severe cognitive issues to begin with. This could mean that blueberries may show a beneficial effect in those with cognitive impairments, but may not show measurable benefits in those who have minor memory issues, or in those who have not yet developed cognitive problems. In a future study, the researchers plan to conduct a blueberry study in a younger group of participants (ages 50 to 65) that would include those who have risk factors of Alzheimer’s, such as obesity, high blood pressure, or high cholesterol. Krikorian R, et al. 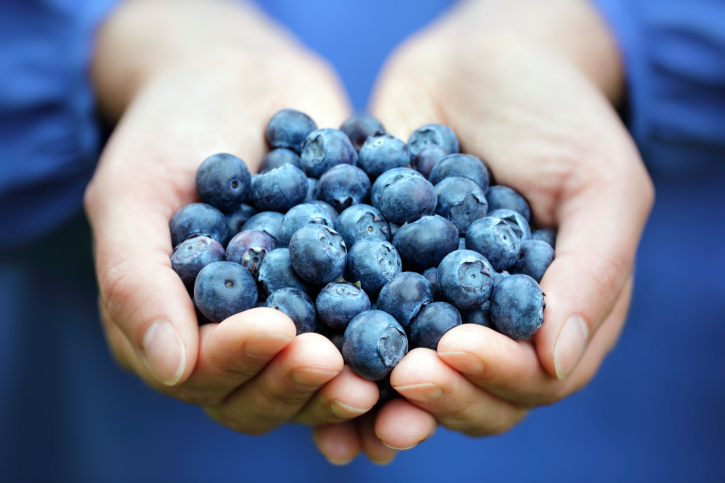 Blueberry Fruit Supplementation in Human Cognitive Aging. Presented at: The 251st National Meeting & Exposition of the American Chemical Society (ACS). March 13-17, 2016; San Diego, Calif.